The wait is over after many years of being told a Miguel’s Jr was coming to Rialto only to find out the opposite. Now Rialto has a Miguel’s Jr and the newest addition to the Renaissance development will open up to serve the greater Rialto Area. Besides amazing food Miguels Jr is one of the last family owned businesses. The original owners are still involved with the company and the children make up the top levels of the company. The company still uses the same cheese provider and has their hand stretched tortillas made without GUM a chemical additive that makes tortillas more elastic. In the age of technology where we get all of our information it hurts when a website goes down, but outside of the Covered California website most of the time government websites are pretty bullet proof. Well since this morning the Rialto City website had a blue screen advertising other websites and stating that the City of Rialto’s domain had expired!!! So the cities domain name is good for now but this still means that if you need to access any information or phone numbers for the city you are at a loss and have to go down to an already understaffed city hall!!! We reached out to Mayor Robertson who said at the time we reached out that she was just made aware of the situation. City staffer Angela said that IT has been notified but gave no ETA for when the website would be back up! If you are having website issues don’t let your website get pulled down and loose valuable time and money have our friends over at Mass Atom Studios help you with your website needs! In a sign of what is going on under the surface of Rialto City Hall another high ranking longtime employee of the City of Rialto’s management team has left the city of Rialto. 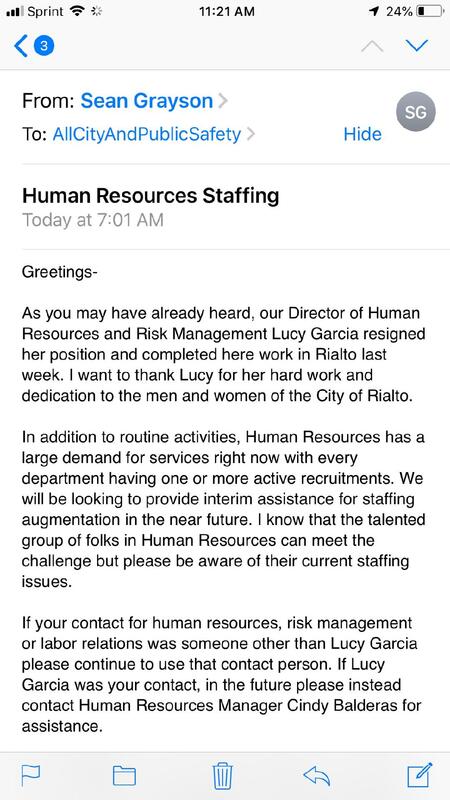 Human Resources and Risk Management Director Lucy Garcia has left the city of Rialto for another unknown agency. For the last year and a half the city has lost seven main leadership positions and has only managed to fill one of them. We learned late last month that Development Director and Assistant City Administrator Robb Steel will be leaving this August. To make matters worse is the City is on its 3rd Interm City Administrator, the people that the city has offered code enforcement and city engineering jobs to turned them down and nobody wants to be our police chief so we brought back Kling who is on a mission to destroy the relationship between the community and the police. Nobody wants to work here and we should strongly question anyone who chooses to except a job here. Sources inside city hall say that Lucy Garcia left because she was being asked to withhold information from employees and do things that were not ethical. The information coming out of city hall isn’t surprising to me since I watched Lucy get attacked by the city council over giving the Budget Advisory Committee the information we asked for and not holding things back. I will point out once more there is no plan for dealing with our $150 Million in Unfunded Liabilities and they just keep adding more and more public safety positions. Just in the last Council Meeting in March the Police and Fire Departments have added staff that were frozen over future cost concerns. Now Rialto has a new police captain we can’t afford and the fire department is adding a Deputy Chief to the payroll. Never in my life have I looked at such a blatant disregard for financial ethics and common sense. Feeding America Riverside | San Bernardino (FARSB) announced it will begin providing a free farmer’s style monthly Kid’s Market (KM) starting Wednesday, March 27, 2019 at Norco-Corona Unified School District’s Parkridge Elementary School at 750 Corona Ave., in Corona. FARSB and local leaders will kick-off the new program with a ribbon cutting ceremony, open to community members with proper identification, at the school starting at 10:15 a.m. The ceremony will be immediately followed by a food distribution where each child will take home an average of 10-15 pounds of nutrient-rich product, including fresh produce. Each KM provides fresh fruits and vegetables supplemented with other healthy shelf stable foods to at-risk children and their families who might not otherwise be able to afford such nutritious foods. Students receive a bag filled with locally grown produce and other food products once per month on a day that school is in session for the academic school year. Feeding America Riverside | San Bernardino has collaborated with school administrative staff and teachers to promote the upcoming distribution to children and their parents and assist support the school as they recruit and manage volunteers (often school staff, older students and family members of students). An additional Kid’s Market was opened by FARSB last week at E. Neal Roberts Elementary School in San Bernardino. “While tens of thousands of families, including those served by FARSB’s more than 400 community partners in the Inland Empire, are receiving meals through our regular distribution programs, many of the poorest and hungriest children slip through the cracks. The KM program targets children by working at public schools where we find the highest percentage of children receiving free/reduced-price meals during the school week,” said Vanessa Mercado, Director of Programs at FARSB. “By focusing our attention on how access to healthy foods affects educational outcomes, we are creating a holistic approach in supporting our community’s kids. Hunger causes a myriad of problems for students like missing class, inhibited cognitive and developmental growth and even poor academic performance. The Kid’s Market is a program that addresses these issues and removes one of the main hurdles to academic success for our Inland Empire kids, regular access to nutritional food,” added Mercado. To RSVP for the ribbon cutting or for more information please contact Vanesa Mercado: vmercado@feedingamericaie.org. Feeding America Riverside | San Bernardino began in 1980 as Survive Food Bank in response to the increasing concern about the dual problems of hunger and food waste in the Inland Empire. Today, FARSB is the primary source of food for over 400 local nonprofit organizations, distributing over 2 million pounds of food monthly to emergency food pantries, homeless shelters, soup kitchens, high-need elementary schools, halfway houses, senior centers, residential treatment centers, shelters for the abused, after school programs and group homes. More than 100,000 men, women and children, rely on the food bank’s distribution center each month to make ends meet. 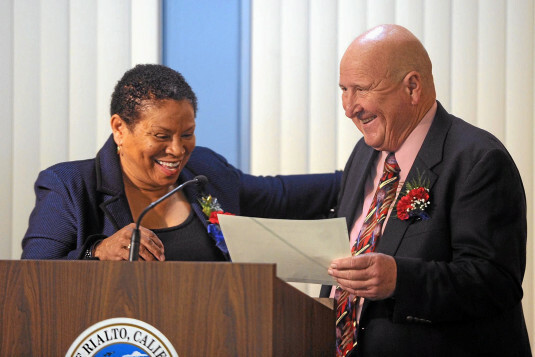 On March 12th 2019 the Rialto City Council held yet another episode of As Rialto Turns. Apparently Iterm City Manager Shaun Grayson and City Attorney Fred Galante gave Councilman Ed Scott a recommendation that he abstain from TAB 1 on the city council agenda because the tab item touched on his area of residence. This enraged Councilman Ed Scott as he is not accustomed to being told what to do. What is funny is this was only a recommendation it was not an order, but Ed Scott took it as he was being forced to abstain. Mr Scott brought up the reason as to why he would not be involved in this tab item but wouldn’t go into detail about why he believed this was taking place short of claiming it was political and was clear in the staff report. What was even more surprising was how quickly Ed Scott shut down City Attorney Fred Galante’s attempt to explain his recommendation and adding “I don’t care to hear your reason” as the city attorney tried to explain his actions. What is funny when Councilman Ed Scott is being sued our money and attorneys are fine to give him legal advise as long as he agrees with it. To add insult to injury Ed Scott voted NO on every other single tab item outside on the tab item presented by Rialto Fire (the union that paid to get him re elected). We are not sure why Ed Scott decided to try and derail over 6 million in much needed infrastructure projects even a $49,000 item for Emergency Slope Repairs at the Rialto Waste Water Treatment Plant. So Ed Scott was mad at the City Attorney and Interm City Administrator but shouldn’t he be able to grow up and at least vote for emergency repairs to our Waste Water Treatment Plant!!! Look to our next story as we outline how staff are fleeing Rialto City Hall in droves and what this says about Rialto’s future! Richard Boltinghouse joins the Rialto Fire Department Family from the City of Chino Hills where he served as the Emergency Services Coordinator. He was responsible for development of their Emergency Operation Plans, Hazard Mitigation Plan, and training for city staff for ICS/NIMS/SEMS. Prior to working for the City of Chino Hills, Richard worked for the City of Corona Fire Department where he had almost seven years of combined employment and volunteer service. At Chino Hills, he served as an Emergency Management and CERT Technician. Richard currently resides in the City of Corona with his wife Christina and their 5-year-old daughter Faithlyn. 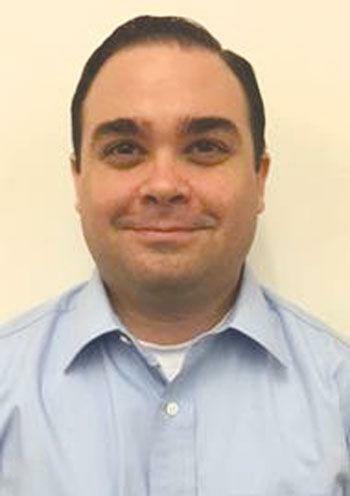 Richard has a bachelor’s degree in fire and emergency management from Kaplan University and a master’s degree in public administration from Cal Baptist University according to his Linkden profile.